Exclusive Song Premiere: GWAR —"Battle Maximus"
Today, GuitarWorld.com presents the exclusive premiere of "Battle Maximus," a new song by GWAR. The song is the title track from the band's new album, which will be released September 17. 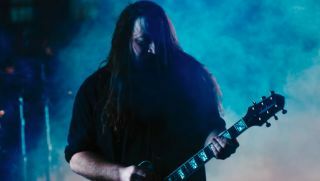 In the midst of 2006's Unholy Alliance tour, Lamb of God guitarist Mark Morton took a few minutes to interview Slayer's Kerry King and Jeff Hanneman.